CAT 2018 Notification: Common Admission Test 2018 notification, eligibility, reservations, exam dates, online registration, cat 2018 score, selection process of IIMs are given below. The Indian Institutes of Management will conduct computer-based Common Admission Test 2018 (CAT 2018) on Sunday, 25th November 2018 in two sessions. CAT 2018 will be conducted by IIMs as a pre-requisite for admission to various management programmes of IIMs. Detailed information on CAT 2018 may be obtained from the CAT website. 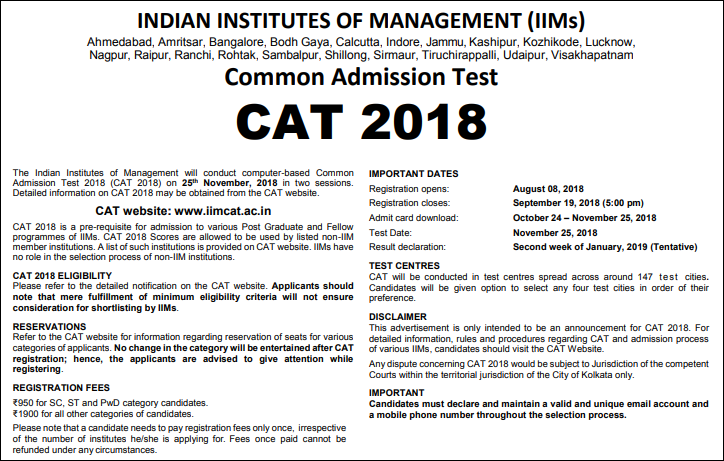 CAT 2018 is a pre-requisite for admission to various Post Graduate and Fellow programmes of II Ms. CAT 2018 Scores are allowed to be used by listed non-IIM member institutions. A list of such institutions is provided on CAT website. Ms have no role in the selection process of non-IIM institutions. Please refer to the CAT 2018 Eligibility section of the CAT website. Applicants should note that mere fulfillment of minimum eligibility criteria will not ensure consideration for shortlisting by IIMs. Refer to the CAT website for information regarding reservation of seats for various categories of applicants. No change in the category will be entertained after CAT registration; hence, the applicants are advised to give attention while registering. Rs 950 for SC, ST and PwD category candidates. Rs 1900 for all other categories of candidates. Please note that a candidate needs to pay registration fees only once, irrespective of the number of institutes he/she is applying for. SC, ST and PWD candidates must upload a copy of their SC/ST/PWD certificates at the time of registration. Fees once paid cannot be refunded under any circumstances. The registration window opens on 8th August 2018 and will close at 5:00 p.m. on 19th September, 2018. The details will be available in the registration guide. At the time of registration, the candidates have to select any four Test Cities as per their preference from the drop down menu. After the last date of registration, candidates will be allotted one among the 4 preferred cities and either of the two sessions. In the rare case that a candidate is not allotted any of the preferred cities, he/she will be allotted a nearby city. The candidates can download the admit cards from 24th October, 2018 till 25th November, 2018. CAT will be conducted in centres spread across around 147 test cities. Candidates will be given option to select any four test cities in order of their preference. Test cities will be mentioned in the CAT website and the name of the test centre will be indicated in the Admit Card. IIMs reserve the right to change or cancel any test centre/city and/or change the test time and date at their own discretion. Candidates’ CAT 2018 scorecard will be made accessible at the CAT website. Candidates may also be intimated individually by SMS. The CAT results are likely to be declared by the second week of January 2019. CAT 2018 score is valid only till December 31, 2019 and will accordingly be accessible on the website. Thereafter, no queries related to issuance of CAT 2018 score cards will be entertained. Please note that each IIM is independent to mandate their own eligibility criteria (including academic cut-offs and relative weights) and follow different selection processes. Performance in CAT 2018 examination is an important component for consideration in the selection process. IIMs may also use previous academic performance of the candidates, relevant work experience, and other similar inputs in short-listing of candidates at various stages of the selection process. For more information, candidates must refer to the respective websites of the IIMs. IMPORTANT: Candidates must declare and maintain a valid and unique email account and a mobile phone number throughout the selection process. This advertisement is only intended to be an announcement for CAT 2018. For detailed information, rules and procedures regarding CAT and admission process of various IIMs, candidates should visit the CAT Website. Any dispute concerning CAT 2018 would be subject to Jurisdiction of the competent Courts within the territorial jurisdiction of the City of Kolkata only.